I have been a fan of Carcass for quite some time. I inherited a copy of Heartwork on cassette from my sister and I never gave her it back despite her ardent requests. I now have at least 3 different copies of that album and even though it seems ridiculous, such is my obsession. Carcass have always been a band unlike any other. They share influences with other bands and are a product of what was a very exciting time for metal music in the early 90’s, but they have always held their own quietly and without a hint of pretence despite them being one of the most iconic bands in recent history that fans love returning to again and again. Carcass as far as I’m concerned are on a pedestal and I was quite apprehensive as well as overwhelmingly excited when they revealed they would be making a return with a new album and accompanying live dates. My fear was that they would just regurgitate all that had come before, or that they would have forgotten about the essence of Carcass and their accessible grandeur. Another fear was that they would fall into the ‘faster than thou’ mentality that occupies the death metal genre nowadays; not that it is a problem, it just wouldn’t be Carcass. Everyone I spoke to wanted the new album to remind them why they still maintained their affection for Carcass. They didn’t want that affection to become shameful if the band released something half arsed and conformist; although we need never have been afraid of that. As soon as the artwork for the new album was released, I knew that Carcass were going to deliver the goods with Surgical Steel. 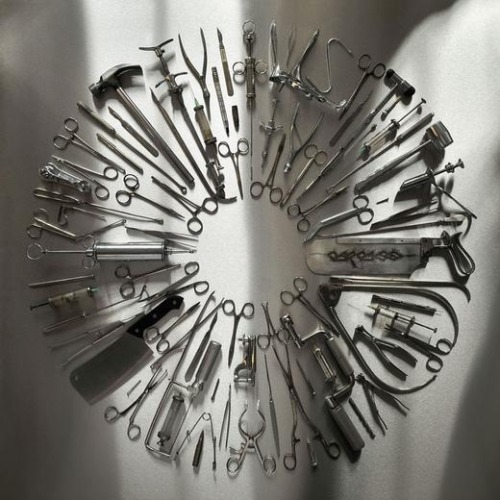 The perfect circle of surgical instruments on the cover was both subtle and shocking; something that Carcass are masters at and it is with that mentality that I approached my listening. The album begins with the trademark Carcass guitar harmonies and a ringing solo over the top that draws you slowly in only to be thrown back by the aggressive and impressive Thrashers Abbatoir. This song is pure Carcass, but not only that, it is Carcass grown up and this impression shapes the feel of the whole album. It is surgical in its precision and beautifully crafted with all the necessary elements of a Carcass formula, that is enticing vocal hooks, full bodied guitar harmonies and just the right amount of technicality without being silly. Any self-respecting guitarist would be impressed by the solos in Cadaver Pouch Conveyer System and frankly, they’re enough to make you sick with jealousy. It reminded me a lot in its technicality and youth of Children of Bodom’s Something Wild where the guitars are used as more than accompanying instruments. They are pushed to the foreground and speak as frequently and in the same tone as the growled, hoarse vocals of Jeff Walker. Incidentally, Jeff’s vocals have not altered at all over the years and therein lies another boon for the album. It is as if he has stepped out of a time machine, and his growl is one of the most recognised in death metal. He is both perfectly articulated and full of malice and his great appeal for a lot of people is that you can actually follow what he is saying very easily. The Master Butcher’s Apron with its ringing guitar harmonies, impeccable drumming and thick chugging riffs is one of my favourite on the album and is a display again of Carcass’s maturity, musical ability and incredible talent for song writing. There is variety without being random and a real sense that Carcass as a collective enjoyed making the album and that they don’t need to prove anything to anyone. The track Noncompliance to ASTM F 899-12 Standard stampedes away and shows odd extremely impressive guitar work even further and expresses musical prowess that imitators can only dream of. Carcass are undoubtedly a set of formidable musicians and the originality of their music and song writing as progressed as much as they have, although it still retains that remarkable and age defying feel they exposed us all to during the early 90’s and their subsequent releases. A surprising track on the album and very revealing of Carcass’s talents is the ultimate track on the album: Mount of Execution that makes use of acoustic guitars in its introduction and offers something of a remarkable contrast and display of musical ability. The latter half of the song is intense and full of menace. Jeff’s vocals really add a sense of terror that when coupled with the chugging guitars and ridiculously articulate guitar solos form a sound that we die-hard Carcass fans have been longing for over the years. Overall, Surgical Steel is extremely impressive and worthy of all the hype it has been given. It is something of a legend and Carcass are a remarkable band for delivering so completely to a legion of fans with such high expectations. It is enjoyable, accessible and doesn’t saddle itself with a crippling narrative or unnecessary embellishment. It is just a representation of all that Carcass are and it displays all of the band’s best qualities in the best possible way. They could have easily taken the formulas of their previous releases and rehashed them, but they didn’t. They improved themselves and injected maturity as well as a compassion for their fan base into their work in order to deliver something that is true to the heart of Carcass and cannot be imitated; no matter how hard we try. If you haven’t already got yourself a ticket for the Damnation festival in Leeds, I strongly suggest that you do so, or face missing out on an event that all of your friends will be talking about for years to come. Carcass leave a distinct impression when they play live as they articulate their albums perfectly and show off their talents almost to the point of obscenity and only a fool would willingly miss such a display of power. If in doubt, pick up a copy of Surgical Steel and have a taste of what can only be described as a monumental album. British extreme legends Carcass have now made their second track-by-track for Surgical Steel available for viewing online. Watch guitarist Bill Steer and drummer Dan Wilding explain the songwriting process for The Master Butcher’s Apron, Noncompliance to ASTM F 899-12 Standard and The Granulating Dark Satanic Mills below. Surgical Steel will be released on 16th September in the UK, the rest of Europe on 13th September and 17th September in North America. 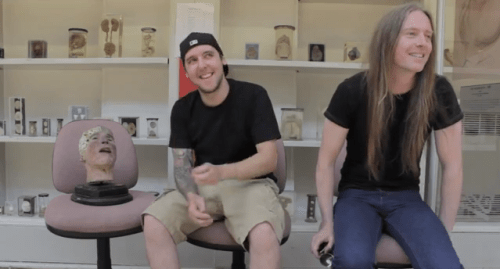 British extreme legends Carcass have made their first track-by-track video available, which breaks down every song on their upcoming album Surgical Steel. You can watch guitarist Bill Steer and drummer Dan Wilding, below, explain the songwriting process for songs like 1985, Thrasher’s Abattoir, Cadaver Pouch Conveyor System and A Congealed Clot Of Blood down below. Surgical Steel is scheduled for release on 16th September in the UK via Nuclear Blast, 17th September in North America and 13th September in the rest of Europe. Surgical Steel is Carcass‘s first release since the release of Swansong in 1996, almost 20 years ago. Carcass are also headlining the main stage at this year’s Damnation Festival in Leeds on 2nd November. Tickets are available from this location. We are extremely happy and flattered to have been invited by the mighty Amon Amarth on their forthcoming raids upon the fatherland and it’s borders. Carcass has not played a club tour in Germany for TWENTY YEARS!!! Yes I repeat TWENTY YEARS! This is gonna be great with both bands playing songs from their new killer albums Deceiver of The Gods and Surgical Steel! Anglo-Nordic Death Metal über Deutschland! 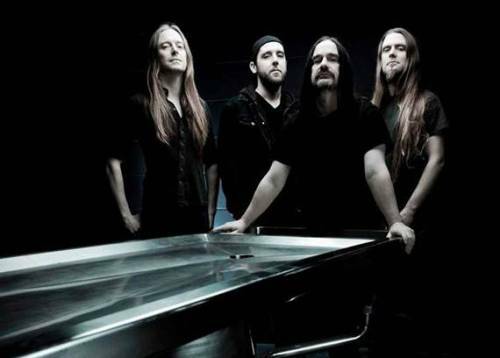 Carcass recently signed to Nuclear Blast for a world-wide deal – excluding Japan – with the new album Surgical Steel to be release potentially in autumn. Disinterred British extreme metal legends Carcass have signed to Nuclear Blast Records for the world – excluding Japan. Surgical Steel, the band’s first studio release since their 1996 LP Swansong, was produced by Colin Richardson (Naplam Death, Bolt Thrower, Gorefest, Cannibal Corpse) and mixed/mastered by Andy Sneap (Megadeth, Accept, Exodus, Testament). Joining guitarist Bill Steer and bassist/vocalist Jeff Walker in the band’s current incarnation are new drummer Dan Wilding (Aborted, Trigger The Bloodshed) and guitarist Ben Ash (Pig Iron, Desolation, Liguefied Skeleton). Expect some guest vocals from original sticksman Ken Owen as well, when Surgical Steel is released world-wide this Autumn. We are pleased to announce that we have found the perfect home for Surgical Steel, the first Carcass album for, what, eighteen years?! We’ve inked a deal with Nuclear Blast for our new baby. We have to thank Markus Staiger for his enthusiasm and belief in what he heard, but mostly his ability to take advantage of Jeff with a bad hangover when he visited the office in Stuttgart to let him be the first to hear the rough mixes. Nuclear Blast has managed to secure this release despite interest from all the main players in what remains of the metal ‘music industry’. We’re also looking forward to working with our pals in the US Office, who have done favours for us behind the scenes over the last few years. On a personal note, Jeff looks forward to his and label manager Gerardo Martinez‘ friendship to come crashing down in flames and tears in a few months. As long as we don’t mention ‘The War’ we think we’re going to do just fine with our new Teutonic home! One of my all-time favourite UK Metal Bands signed recently to Nuclear Blast – it feels like a dream come true. When Jeff Walker let me listen to the new record I knew immediately that Carcass made one of their best albums ever! It is a perfect mixture of Heartwork and Necroticism with a massive production to boot. The album is without a doubt just as perfect and lethal as surgical steel itself, and exactly what both old and new fans have waited for eagerly all of these years! I am very proud to say, Carcass – welcome to the Nuclear family. It is an honour to work with this legendary metal band. First of all, apologies to the many that were wondering where that signing statement was the other day. Well, we didn’t anticipate the prenuptial agreement to take this long but here we are, and about to release to the world what many people said would never happen: a new Carcass record! All joking aside, this is a dream come true. All I can say is that even the biggest critic, Señor Walker himself included, will find this to be one of the best Carcass albums. It already sounds like a classic and I can’t wait for people to hear it. ‘Time to die, die in pain’!! !